The ultimate method of maximising your brand promotion at an exhibition is to design and build a custom stand, configured to your specific requirements without the restrictions of shell scheme walls. We specialise in the creation of bespoke exhibition stands working closely with our clients in partnership to maximise the return on investment. 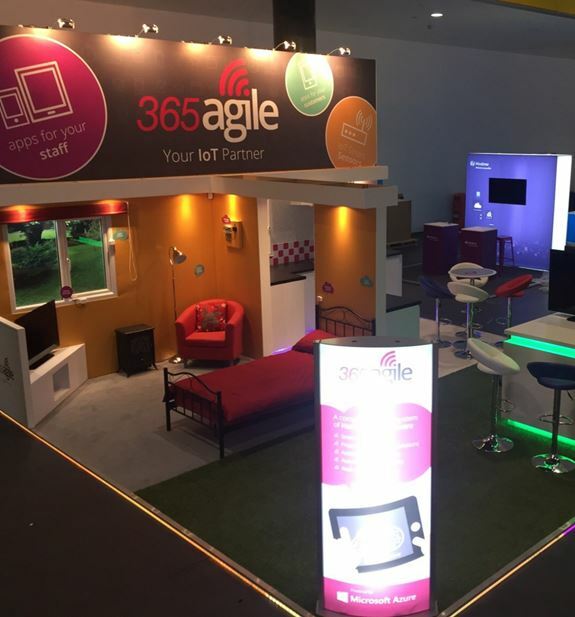 With a clear design brief and success plan our clients have seen significant benefits from moving to a custom build exhibition stand, increased customer engagement producing better higher quality leads and ultimately an increase in sales conversion. A custom build stand is configured for Space only at events and with this there are many other elements that have to be considered such as electricity, internet, flooring, hardware, graphics, installation, storage, Health & Safety, Liability insurance, Risk Assessments, Method Statements, Plant hire, etc. Successfully managing a project like this requires professional assistance. iDeal Displays work tirelessly to deliver exhibition stands with impact, liaising with Event Organisers and managing the complete process, ensuring your focus and priority remains on capitalising on the lead generation from an event. We offer a complete service ranging from initial design concepts, managing all elements and submissions through to transport, installation, breakdown and storage of your exhibition stand. 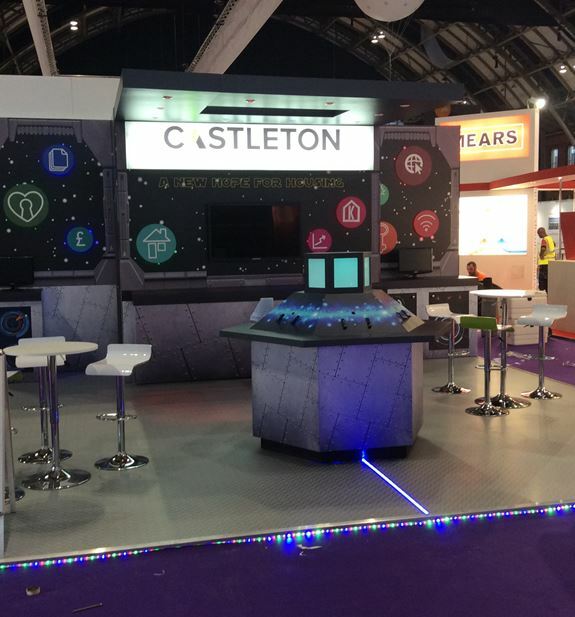 iDeal Displays, the graphics business that creates intelligent visual solutions, was the stand designer and developer behind the Best Stand at the recent IT in Housing Exhibition for their work with software and infrastructure specialist Castleton Technology. The stand captured the event organiser’s attention with its spaceship theme. Built on a floor space of 6 metres x 5 metres (30M²), it included LED illumination surrounding the floor. LEDs also channelled into the flooring from a custom built illuminated hexagonal demonstration counter. The rear of the stand provided a central store area built into the 4 metre high walls. Keeping with the theme, this gave the perception of a spaceship control deck looking out into space with a floating overhead canopy providing stand illumination. took place at Chelsea Football Club, is organised by Foremarke Exhibitions. Every year, the company presents an award for the best stands in both the space only and shell scheme categories.Having won the award at a previous IT in Housing show for its client, Documotive - now part of Castleton Technology - this year’s win is iDeal Displays’ 6th success at the long-running housing sector event. reputation nationally and internationally by providing high quality print graphics for signage, exhibition stands, building wraps and vehicle wraps. Working with a cross-section of clients from blue chip organisations to leading local businesses, iDeal Displays provides full service management for clients. Are you thinking about a custom exhibition stand for your next event to help you stand out from the crowd? Then give us a call today and let us help you with this exciting project.